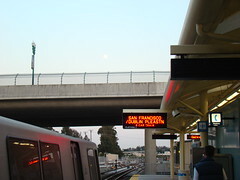 Initially, scheduled train arrival times will be displayed on the signs, as well as service disruption information and other RT news. Real-time train arrival times will be displayed starting in spring 2011 using GPS to track the movements of RT vehicles. This is a pretty nice addition to the light rail commute. If the trains could only serve more people it would make up for the thrice annual cuts to bus service. I hope the signs will display the number of cars in the arriving trains as this would alleviate my frustration with the variable train size. And changes that alleviate my very minor frustrations should always be executed, no matter the cost. Wow, all those cuts are not only saving money…but they must be MAKING money! Maybe they could advertise on these signs and stay afloat and/or buy an RT corporate yacht! While I love the idea of the signs, I’d gladly forgo them to have RT run later at night. The signs were paid for by a separate grant that was intended specifically to pay for enhancements like this one, but even if it wasn’t, it wouldn’t add up to enough money to fund later transit operation on an ongoing basis. Unless another source of ongoing revenue for operation can be identified, whether by more tax income (like a special assessment) or some other source of income (like selling advertising at stations or on trains, a worthwhile idea in my opinion) there isn’t a way to fix the damage done by the past couple of state budgets that totally defunded local transit systems. Currently, federal grants can only be used to expand transit lines, not to fund regular operation, because new construction is a one-time expense and operation is a regular, recurring expense. I realize that CoolDMZ is already bored by these boring details about how things work, but sometimes I can’t resist the urge to skip the occasional fact across his stream of consciousness. RT’s paper-thin budget and very large service area make improvements like later operation and filling in transit gaps very difficult. Not having enough money to properly develop and operate a transit system leaves one with a “half a boat” situation–having half a boat is not 50% as useful as having a whole boat, it’s pretty much useless even though it costs half as much as a whole boat. Our transit system is a little better than that–as mentioned above, it is acceptably adequate for some things–but for other things it would be nice to have transit for (like visiting outer suburbs, or getting home after 9 PM) it’s about as useful as half a boat. And then, of course, there are the people who don’t want transit anywhere near them, and fight it tooth and nail, because then THOSE PEOPLE (you know, those people) would be able to visit their neighborhood with impunity, as though they had a right to be there or something. yes of course, anybody that dares to question public transit must be a racist. Dude why do you have to pick on me like that? Read my post again and tell me where I am factually incorrect. All I did was lament the fact that bus route cuts happen with a frequency. You’re reading between the lines. That being said, that’s good knowledge you dropped on us. And I agree that more advertising would be a fine way to go. I think they should even sell space on these new signs. Previous Previous post: Slow News Day?